Special Features: Introduction and commentary by Frank Capra Jr.
Light, fluffy, charming and endearing. These are all words frequently used to describe the lovable works of Frank Capra. Though dubbed "Capra-corn" by some, his delightful films are much more than mere empty, sugary goodness. They touch upon powerful, universal themes in an entertaining and thoughtful manner. Then again, they also have a tendency to leave one feeling unrealistically optimistic and bright-eyed about the limitless kindness of humanity and the world at large. OK, so maybe they are "Capra-corn," but I wouldn't have it any other way, and 'Lady for a Day' is no different. A life-affirming, joyful little comedy, the film features all of the director's trademark quirks, weaving a fun, cheery story full of heart. While it's not as impactful or substantial as some of his other works, the movie still holds up well, and is sure to bring a smile to even the most jaded and cynical of viewers. 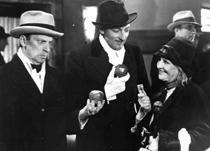 Apple Annie (May Robson) is a poor, old apple seller in New York City. Estranged from her daughter, Louise (Jean Parker), the two communicate solely by mail and Annie has led the girl to believe that she is a wealthy socialite. When Louise informs Annie that she is coming to visit along with her fiancé (who happens to be the son of a count), Annie becomes distraught, not wanting her daughter to discover that she really lives in poverty. Thankfully, a local gangster, Dave the Dude (Warren William), has taken a liking to Annie and he hatches a scheme to help her out by transforming her into a real "lady." Unfortunately, Dave's activities catch the attention of the police, and slowly but surely it seems like Annie's elaborate ruse might fall apart. A slight twist on a classic rags to riches fairy tale, the movie is old fashioned and very simple, but still effective. Capra puts together an eclectic and fun group of characters, mixing up gangsters with street peddlers, lounge singers, policemen and aristocrats. Each performer gives their role life and personality, filling the screen with humorous and dramatic relationships. May Robson is both prickly and fragile as Apple Annie, endearing the character to the audience with her strong spirit. Likewise, Warren William does a great job as the kind-hearted gangster who goes out of his way to help a nice old lady. Little by little he sheds his gruff exterior, revealing compassion and warmth. Screenwriter and frequent Capra collaborator, Robert Riskin, litters the proceedings with witty dialogue and snappy verbal spars. Some social commentary is even snuck in between all of the goodwill and humor, illuminating class distinctions while revealing some of the Great Depression's heavy toll on citizens. As the movie continues, Apple Annie and Dave's deception grows increasingly elaborate and complicated leading to a wonderfully paced buildup of comedic tension. This all results in an exciting, whimsical and emotional climax. That being said, the narrative can't help but feel a little thin. While the movie's simplicity is part of its charm, the fact of the matter is, there just isn't a lot of meat to the plot and characters. Apple Annie becomes marginalized as the running time goes on, with Dave the Dude getting more attention, and while this works just fine, neither role ends up getting enough development. Secondary characters have decent presence, but again, many, including Louise, aren't given much to do. Some of the film's early drama can also seem a little overdone, with Annie's plight veering toward the maudlin. Thankfully, these minor criticisms are just that, minor, and though the movie is a little too straightforward and basic for its own good, it remains entertaining, funny and touching throughout. With 'Lady for a Day' Frank Capra gives audiences a sweet story about kindness and community. With simple setups and a humorous, moving script, the film manages to overcome some underdeveloped aspects through sheer heart and soul. The shared enthusiasm of gangsters, peddlers, and law enforcement toward helping a single old woman might seem a little unrealistic to some, but that's all just part of Capra's magic. He doesn't always show us who we are, but rather who we are capable of being. In the end, the motivations behind his characters' actions couldn't be more honest or uncomplicated. Why does a gambling criminal and a whole city of strangers band together to help poor Apple Annie become a 'Lady for a Day?' Well, because sometimes it's just nice to believe in fairy tales. 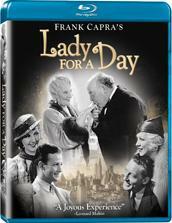 'Lady for a Day' is brought to Blu-ray by Inception Media Group on a single BD-25 disc housed in a keepcase. The disc immediately transitions to a standard menu upon startup. The packaging indicates that the release is region A, B, and C compatible. An insert with an essay by film critic Scott Eyman is also included. Introduction and commentary by Frank Capra Jr. The movie is provided with a 1080p/AVC MPEG-4 transfer in the 1.33:1 aspect ratio. Considering the age of the material and the unfortunate lack of an original print to work with, this looks pretty good overall. The source print has been nicely cleaned up (as demonstrated in the included restoration featurette), but there are still some occasional specks, scratches and vertical lines. Moderate grain is present throughout but has a rather course appearance, lacking the fine texture of some other releases. Some very minor flicker is also visible from time to time but isn't a major concern. The film has a very soft appearance, and while this seems to be inherent to the original photography, it doesn't lead to a very impressive presentation. Fine detail is marginal, and many scenes exhibit a fuzzy, almost blurry quality with no real sense of depth. Contrast is a little low, resulting in slightly muted whites and sporadically elevated blacks. While 'Lady for a Day' can't compare to other, more visually impressive classic titles, the video's flat dimension and soft clarity appear to stem from the film elements used and not any digital transfer related issues. For all intents and purposes, this is a respectful looking image. The movie is presented with an English PCM 2.0 mono track with no subtitle options. Again, given the age of the film, the mix is actually pretty good, though there are some hiccups here and there. As soon as the film begins, some heavy background hissing becomes audible, but thankfully this cleans up nicely almost immediately. With that said, some hissing and pops are still present periodically, but don't dramatically hurt the experience. Dialogue is clean and easy to understand, but as is the case with many movies from this time period, speech is comparatively thin. Effects work and score are all handled fine in the mono channel, though range is on the flat side. Basic but serviceable, the film sounds about as good as it can. This modest, nearly eighty year old mix won't be winning any rewards, but it suits the movie just fine with no major problems. Inception Media Group has included a very slim collection of supplements. The menu gives viewers the option of watching the film with an introduction by Frank Capra Jr., with the audio commentary, with both, or with neither. Audio Commentary with Frank Capra Jr. – Frank Capra Jr., the son of the film's director, provides commentary on this solid but not particularly noteworthy track. Capra discusses the short story which served as the basis for the script, the movie's context within the Great Depression, his father's narrative and visual style, character analysis, and shares some amusing anecdotes about the production (including a particularly cringe worthy story dealing with the Academy Awards). Capra also spends a fair amount of time discussing some of his father's other works including 'It's a Wonderful Life,' 'Meet John Doe,' 'A Hole in the Head,' and 'Pocketful of Miracles' (which was actually a remake of 'Lady for a Day'). Big fans of Capra should definitely give this a listen. Frank Capra Jr. Introduction (HD, 1 min) – Presented in 1080i with LPCM 2.0 sound this is a very brief intro by Frank Capra Jr., giving some background information on the film and its award nominations. Restoration Before and After (HD, 5 min) – Presented in 1080p with LPCM 2.0 sound this is a split screen comparison that shows the video before and after the restoration process, giving us a nice look at all the damage that was cleaned up. Still Gallery (HD) – A gallery of thirty seven stills is included. Simple, sweet, and a tad whimsical, 'Lady for a Day' is a heartwarming little film. Though not quite as memorable as some of his other works, the movie is still a respectable entry in Frank Capra's celebrated filmography. Video quality is a bit underwhelming, but given the lack of the original film elements, the transfer seems to faithfully represent the intended look well as possible, and while the audio shows some age, it gets the job done just fine. Unfortunately there aren't many special features, but the commentary offers a decent discussion of the film and the director's work as a whole. Worth a look.